Paul Barden Roses: 10-05-05: an orange moss. 10-05-05: 'Condoleezza' X ('Sequoia Ruby' X 'Scarlet Moss'). The pollen parent, which is extinct thanks to Gophers, is a sister seedling to 'Unconditional Love', one of my commercial releases. The plant is a compact, shrubby thing, having grown to 2.5 feet so far, but since it has lived its life in a pot, it may get significantly larger if grown out in the open garden. Blooms are about 2 to 2.5 inches each, with 8 to 12 petals and a few petaloids. The petals are a strong, clear yellow at the base, which may be an indication of its potential as a breeder of yellows. While I think the Ralph Moore mosses are marvelous plants, I feel there is a lot of room for improvement on the group. In the pursuit of dwarfism, I think Ralph made compromises when making his selections. Certainly some of the "mini mosses" are wonderful breakthroughs in breeding, but most leave something to be desired as far as plant architecture, disease resistance and stability of color goes. As I say, lots of room for improvement. What would I like to see happen with this group of plants? 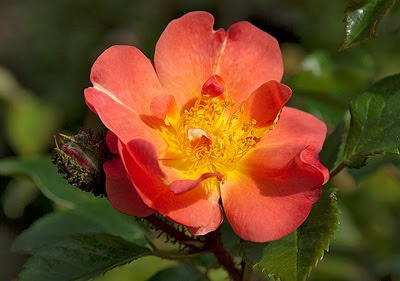 Well, increase in both the plant stature and in bloom size, for one; I am imagining a rounded shrub of about 4 X 4 feet, well articulated with foliage to within a foot of the soil. (In a similar line of breeding I have accomplished this goal already with 'Treasure Trail', a very attractive pink-yellow blend moss that is about 3.5 feet wide and tall.) I would also like to see a significant improvement in disease resistance, This I believe can come through 'Scarlet Moss', which has the wonderfully sturdy 'Dortmund' represented on both sides of its parentage. Take note Hybridizers: both 'Scarlet Moss' and 'Rose Gilardi' have 'Dortmund genes in them and both are potentially the best breeders to pursue for improvments in the moss genre. Improvements in color intensity and stability are also very possible and again, 'Scarlet Moss' and 'Rose Gilardi' are likely to be useful in this regard. Although the odds of success are slim, I have made one more attempt in 2009 to use Moore's old breeder "Orange Moss" in combination with seedling 10-05-05 and its sibling 10-05-09, a clear yellow. "Orange Moss" is a poor choice in that it rarely breeds any strong colors, and it has a dreadfully weedy growth habit. (Read; tall and lanky) However, I gave it a go with these two seedlings, hoping the stronger color genes of the 10-05's and their compact growth habit might tame "Orange Moss" and pick up on its lovely coloring. We shall see. Its all just wishful thinking until the first seedling flowers! I picked up Rose Giardi two years ago for breeding. The three big draws for me was; 1. it was said to be fertile both ways, 2. it also was striped, 3. it had Dortmund in it. I remeber looking at Orange Moss and seeing Mark Sullivan in the parentage scared me away from it. On your unconditional love I keep on putting it on my wish list and then crossing it off right before I make my order. If only I had more room. Is it fertile? 'Unconditional Love' is quite fertile in both directions, yes, and I expect it has merit as a breeder. However, I have not explored it yet. I know what you mean about 'Mark Sullivan'! This may be why "OM" is such a mediocre breeder, but you have to remember that it was an important starting place. I agree that Mark Sullivan is an important starting place. I just saw better ones out there and not having that much room I decided to go another direction. I wonder what the miniature moss roses would look like if Ralph had breed them at the beginning of his career and had more time to work with them. He has certainly left many breeding directions only partially developed for other to build upon. Certainly I think if he had more time the hulthemia and bracteata line would have been more developed. 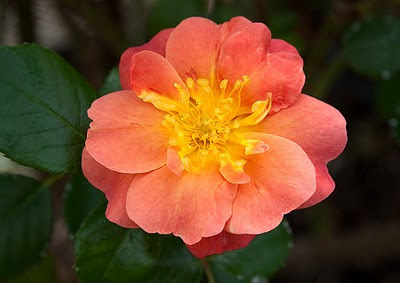 I am planning to cross Rose Giardi with William Baffin and hopefully something else but William Baffin will be my main choice for its first real year of bloom. I am kind of hopeing for a climbing mini of mini-flora. 'William Baffin' is an odd duck when used in breeding. When crossed with a Miniature, the majority of seedlings will be large, arching shrubs. Usually, most seedlings of a Miniature X Shrub cross will be dwarf to some degree, but 'William Baffin' behaves quite differently. Years ago I made a cross of a yellow miniature X 'William Baffin' and got many large arching shrubs in pinks and yellows. One was a semi-miniature arching shrub that had small blooms and small foliage, and did not exceed 3 feet tall. Perhaps that is the sort of thing you are aiming for? 3 feet tall would not be too bad. I prefer miniatures that are either climbers or about the size of baby love. I think the smaller ones are cuter but I think it is easy for them to get lost in the average garden. Knee to hip high is better for most gardens. Oh it is good to hear about unconditional love. Knowing it is fertile will influence my decisions. But it will have to wait until I get what I want from some other roses. New foliage and the promise of Spring. To celebrate a sunny day: 1-72-1 by Ralph Moore.